THIS IS IT! 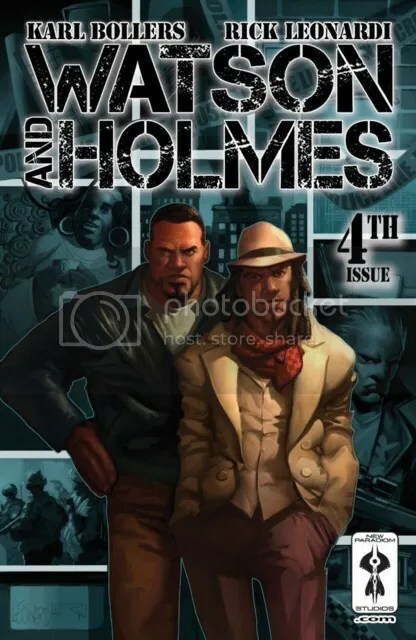 The epic conclusion of the premier story arc starring Sir Arthur Conan Doyle’s Watson and Holmes, culturally recast as modern day, African American crime solvers. Believe the hype! When we say epic we mean epic! To save the life of the final target on a hit list, our heroes have no choice but to confront the mercenaries full on. Watson’s military training and Holmes’ brilliantly trained mind are on full display as they devise a way to stop the bad guys once and for all. It’s a nail-biter that will test the limits of their new partnership… if they survive. Yes, I’m REALLY late here, but now it’s time to play catch-up. Picking from the last issue, Watson, Holmes and their prime witness find themselves cornered in building in Brooklyn being shot at by armed mercenaries, and the only way out is to make to the roof, where a sniper is waiting for them. Several tense action-packed pages of gunplay and improvised explosives later, Lt. Stroud and her men are on the scene, and Watson and Holmes’ main witness is dead. But Holmes still has a view tricks up his sleeve, and manages to find another lead. He and Watson split up for the night. Holmes goes to follow up on his lead, while Watson attempts to visit his wife, with high hopes of reconciliation which are immediately dashed when he finds her embracing another man. Meanwhile Holmes finds some crucial evidence in the case, only to discover that the bad guys are stalking Watson and threatening his life. Holmes is forced to give up his evidence, in exchange for Watson’s safety. I liked this moment as it showed that Holmes has a heart, and that in this relatively short time they’ve been working together, he has come to care about Watson enough that he’s willing to risk blowing the whole case to keep him safe. I also like that Holmes never reveals this turn of events to Watson. keeping Watson’s conscious clear. As the issue continues, we get more examples of Holmes’ uncanny observational skills, and the discovery of a criminal conspiracy with much wider resources than previous expected, including possible informants within the NYPD. Finally, Holmes makes Watson the offer to stay with him, and continue working with him on further cases. With not many other options available, Watson takes Holmes up on his offer, and a new crime-solving duo is born. Thus concluding the opening arc, and origin story, of this bold reimagining of Sir Arthur Conan Doyle’s legendary creations. I know I didn’t give too many details of the story in this issue, but that’s because I don’t want to spoil anything. Suffice to say that although elements are left open-ended, I consider this to be satisfying conclusion to this story. This has quickly become one of my favorite new comic-book series. Writer Karl Bollers (working on a story by Paul Mendoza and Brandon Perlow) and artist Rick Leonardi have been bringing their A-game with each issue, and if this continues, I believe that New Paradigm Studios has got a major hit on their hands.